[This post has been updated] Dogs in Canada magazine, which has been published for a century, is to cease, effective with the end of this year. 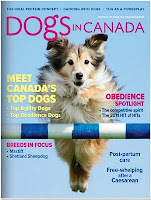 The Canadian Kennel Club board of directors decided at a meeting Sunday that the 2012 Dogs in Canada annual and the December 2011 issue of Dogs in Canada magazine will be the last. The magazine(s) were owned by the CKC's wholly owned subsidiary, Apex Publishing. Publisher, Ann McDonough, who had been with the magazine since 2006 and had previously been with Rogers Publishing, Brunico Publishing and the Globe and Mail, has been let go. Founded in February 1889, Dogs in Canada is (was) Canada's oldest continuously published monthly magazine and its public face was as Canada's top selling pet magazine with Canada's top-selling annual. It had paid circulation of 42,000 including 19,000 members of the kennel club and 20,000 family dog owners as well as a small controlled circulation to veterinarians and technicians. For many years, under the editorship of Allan Reznik, the magazine was a major winner at the Dog Writers' Association of America competition in New York. Its website, DogsinCanada.com, won the first National Magazine Awards website of the year. A statement from the board of directors posted on the CKC website says "there is no reasonable expectation of profit for Apex Publishing." "This decision has come after many months of consideration and evaluation of the financial circumstances currently impacting Apex Publishing, the Canadian Kennel Club, the publishing industry in general and in particular, the hard copy production of periodical journals in Canada. "The decision to discontinue the monthly publication of Dogs in Canada Magazine and the Dogs Annual is solely financial and does not in any way reflect negatively on the dedicated contributions and professional services of Apex staff and their award-winning history in the production of the premier Canadian canine publication." There is some indication that the Dogs in Canada brand will continue in some unspecified way online. It takes a very small mind to come up with an insensitive comment. Bravo to the Editor and creative team at Dogs in Canada..they succeeded in producing an award winning magazine that not only informed but warmed the hearts of their readership. Perhaps. But it takes a far smaller one to take offence at gentle black humour. This information is not 100 percent accurate. Anonymous 4: it might be helpful if you were to say what was inaccurate and provide what you believe is the correct information. Otherwise, there is not much way to respond. Sad to see anyone poke fun at the loss of a Canadian magazine and associated jobs. Among the inaccuracies: the broad editorial mandate in recent years WAS well received by pet and purebred fanciers alike and the mag continued to receive many awards. However, in fall of 2010 the CKC Board of Directors interfered with editorial mandate and ordered purebred-only content. Quickly, subscriptions dropped - including the loss of the majority of CKC member subscriptions. A winning formula was rejected and the results were swift and arguably catastrophic. Dogs in Canada has been terrible for years. It's absolutely correct that breeders for whom the magazine was intended had no interest in the fluffy rag it became. The editorial staff killed it themselves. Sad loss for the Canadian magazine industry and the dog world too. I hope to see the magazine revived in some way. I notice another comment pointed out that the editors basically ruined the magazine and that turned breeders off, if you turn off the breeders, you lose advertisers and they are just as important as subscribers. Now I do want to say that it is sad to mandate "purebred" only content, I hope if revived they would feature a "Shelter dog of the month" or something to remind people that mutts need loving homes too.